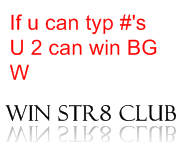 Are you Interested in linking to The Mazk Touch I, II or WIN STR8.com ? This page is for your information, it contains a few of Lottery software that made the cut among an ocean of them! Expert Lotto is an universal and comprehensive lottery tool that supports all x/yy lotteries as well as Keno lotteries. You can choose from a list of ready-to-play lotteries or use Expert Lotto's wizard to setup your own lottery including playslip printing. With Expert Lotto You can create full, abbreviated and random wheels. For example when playing a 6/49 lottery you can work with all 13983816 number combinations. It is also possible to use any filter when generating a wheel to reduce its size - very useful for Keno lotteries. Expert Lotto offers a rich set of filters to implement your lottery strategy. You can even link filters together using logical operators to build complex filtering conditions and then back-test your filters to verify their perfomance on past winning numbers. A special set of coverage filters provide an option to say literally "I want to have 100% guarantee of winning at least one Match X prize when I hit Y numbers of my wheel". Expert Lotto implements a very powerful and unique tool to analyze previous winning numbers. The application presents past winning numbers as eleven chart lines. If you manage to correctly estimate the trend of these lines (i.e. the line will rise/fall in the next draw), Expert Lotto will calculate for you a reasonably small set of combinations (tens to hundreds of combinations) that are 100% guaranteed to include the jackpot winning combination! This procedure is reproducible. Other Expert Lotto features include playslip printing, win coverage reports, online updates, imports and exports to spreadsheet processors, winning numbers managements and much more. LOTTOmania 2005 uses advanced statistical analysis to select the most popular winning patterns consisted of active , average and passive numbers. It works with almost all lotto-type lotteries that draw 4-8 numbers out of a number pool from 1 to 99. Covers 120 major lotteries. Its build-in Suggested sequence Wizard lets you to select the best strategy for the next draw. The software will even: print you lottery tickets, download the latest results , check your tickets for winning combinations, and much more. Lotto Sorcerer is 64-bit, multi-threaded lottery number analysis and lottery prediction software.It uses Neural Networking (Artificial Intelligence) Algorithms to Look for Non-Random and Weighted Influences Inherent in Lottery Drawings. Lotto Pyramid is a full-featured, advanced lottery analysis program which helps you to select tickets for any lottery (except for Pick 3). By the fantastic number analyzer, the program picks the best six numbers from 20 to 99 fields with bonus. It is really an easy award winning way to handle well today's lotteries worldwide. It's Lottery Statistic Analyzer is the result of a thorough study of probabilities, mathematical facts and professional analysts. Following intensive calculations of Pyramid Method, it is able to interpret past statistics to create estimations made on the probability of figures materializing based on associations, patterns, frequency, even-odd numbers and sequences of the previous draws. Lottery Pick 3 is a full-featured, advanced lottery analysis program which helps you to select tickets for Pick 3 numbers (0-9). It is an easily used number analyzer for award winning number selection. Lottery statistic analysis of this software is the result of a long study into probabilities , mathematical facts and professional analysts. Lotto Hat is lottery program that attacks the lotteries from several directions at once. Lotto Hat lottery software makes the tough strategy decisions easy, based on probability comparisons to your actual lottery results game history. Free trial. P34 Lotto is a Windows lottery software program for playing 'Daily pick' lotto games - Pick 3 and Pick 4. Free trial. Lottery Statistic Analyser is frequency analyst software that works by calculating thousands of equations on past draw results then with the findings creates a mathematical algorithm that is unique to your lottery draw results.This is not a random number generator and in no point uses random numbers, LSA is based on math 100% LSA is compatible with any 5 to 7 number lottery with up to 99 numbers. The calculations used to create LSA&apos;s algorithm include Using the number of lottery draws between individual ball appearances. The amount of times each ball appeared. Dates and days frequencies regression techniques Plus much more. This algorithm is unique to the Lottery Statistic Analyser which helps it and you to predict the next 6 draw numbers. LSA&apos;s features. On-line database updatesPerms: 36 different pre made perms, plus create your own feature.Hot Warm and cold number filteringFilter any day, week or month from results i.e filter any March from all years, Calculate ball appearances and frequencies. Detailed statistical analyst reports of past results. Next numbers most likely to appear based on previous draw calculations. Break down number placement graph plus a full results graph, and much more, you have to see this software to understand how powerful it really is. Lotto Picker Lottery Software. An advanced Lottery Software and Lotto Picker tool for predicting UK Lottery Numbers. Increase your odds of hitting the jackpot with The Lotto King, a small but powerful lotto software tool that lets you manipulate your favorite lottery numbers. This dynamic little program will give you hours of fun and enjoyment as you try to beat the odds. Designed for the 6 from 49 systems, you can box and pick your favorite numbers til you find the combination that makes you feel comfortable. The random number generator lets you pick the numbers it randomly generates. Lotto King allows you to set and box a range of numbers, from a low of 6 to all 49. In the main window you can order the Lotto King to choose from six to twenty-six numbers. PayPal and the PayPal logo are registered trademarks of PayPal Inc. Other trademarks and brands are the property of their respective owners.